Posted by Tantumblogo in abdication of duty, disaster, episcopate, error, General Catholic, horror, scandals, sexual depravity, shocking, sickness, Society, the struggle for the Church. As I posted in January, popular pastor Fr. Christopher Phillips was removed by Archbishop Gustavo Garcia-Siller rather suddenly and to the great shock and dismay of the people of the Anglican use Atonement Parish in San Antonio. Many could not fathom why the Archdiocese would take this action. There has been some speculation that it could have been due to Atonement seeking to join the Ordinariate and therefore a turf war over ownership of the really fabulous physical plant of the parish began. Having said that, and having heard very impassioned (and detailed) complaints against a certain Deacon James Orr from current and former parishioners of Atonement going back some time, I have wondered, largely to myself, whether or not an abuse allegation was not somehow involved. 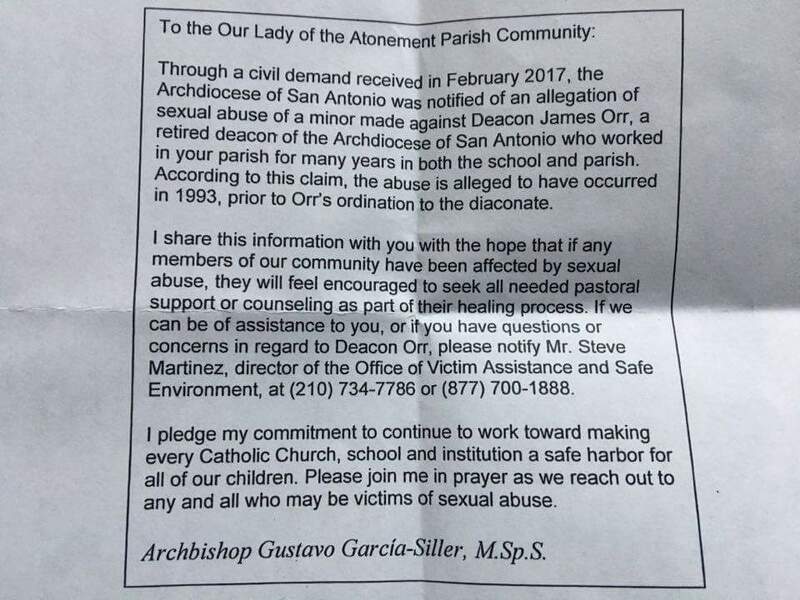 Now, something has emerged regarding retired Deacon James Orr that could have been the instigation behind the San Antonio Archdiocese’s intervention at Atonement Parish. I have heard very troubling reports from family and others who have been a part of Atonement in the past regarding this deacon’s behavior around pre-teen and teenage boys. When I queried someone involved in the parish back in January, who seemed to have some first hand knowledge of the removal of Fr. Phillips, whether this matter of Deacon Orr could have played a part in the situation, this individual rather bluntly derided the idea. I have strong indications from a confidential source who works in the Archdiocese that this may not be the only abuse complaint made against Deacon Orr. Others, of a more recent nature, may be forthcoming. This puts a very different spin on the dismissal of Fr. Phillips. I feel more confident in coming forward with what I have heard for years, from people I know extremely well and explicitly trust, which is that Deacon Orr routinely had inappropriate relationships with young boys at the parish, involving, at the least, what some parents viewed as encouragement of alienation from their family and subsequent provision of financial support on the part of the Deacon when these boys had a final falling out with their parents and moved out of the family home. Some of these relationships were short, others have persisted for years. Some very pointed complaints regarding Deacon Orr’s activities have been made to Father Phillips , again, going back years. I was certainly not a party to any of those conversations, but I know at least some people associated with Atonement felt that Phillips failed to adequately address these concerns and may have even given the impression of dismissing them. Through it all, Phillips steadfastly defended this deacon. This is the situation as I understand it, as has been related to me numerous times from multiple, independent sources. I should stress that most people at Atonement have a great love for Father Phillips and continue to support him. But I would be remiss in not bringing up the very serious and mutually substantiating concerns of a minority whose complaints generally centered around Deacon Orr. I do not know the specifics of the allegation made in February of this year. From what I understand, none of the inappropriate behavior of which I have been aware (as I describe above) ever degenerated to the level of actual physical abuse. I would like to caution everyone not to engage in either excessive demonization of Deacon Orr nor excessive defenses of Fr. Phillips in attacking those who have felt they have had very legitimate concerns for years, and whose concerns now seem to be amply justified. We’ll have to see how this shakes out, but I was always a little suspicious that the Archdiocese of San Antonio would make a naked power play for several million dollars worth of real estate without some serious complaint behind them to back them up. This appears to be it. That doesn’t mean an ideology is not being served. That may well be the case, but it could be there were situations ongoing that had to be addressed. It’s difficult to say at this point. PS – Some will say that the Archdiocese moved against Phillips in January, before this allegation was formally made in February. But I would be a hefty sum the Archdiocese knew of the coming allegation before it was officially made, and that may explain the timing. Very unfortunate situation, but your analysis makes sense, as does your caution against calumny toward anyone involved. True motivations at the chancery may become clearer, though, once we see how they handle the application of the parish to join the Ordinariate. Even if the pastor failed to handle such allegations against a deacon in his parish properly, that should have no effect on such an application. I spent more than a year at Atonement, and I’d say the chances are 99% it is a monstrous bishop with a knife out for a conservative priest with a rich parish. Remember the archbishop’s letter that said he wanted to stamp out Atonement’s unique and separate identity. I didn’t get to know Deacon Orr, but I find it hard to believe there were real improprieties. Not discounting the sources you mention, but it’s just hard to believe. If he had been involved in a scandal, where would he go? He’d have to leave the archdiocese. I wouldn’t rule out the possibility that somebody from the Chancery made anonymous allegations so that they could steal the parish from Fr. Phillips, the wolves. The state of the archdiocese of San Antonio was a disaster. The normal parishes were horrendous, with utterly predictable, very bad politics, and with architecture so bad that the bishop should have demolished many of them. Instead of inviting the FSSP to bring a desperately needed measure of sanity to the Archdiocese, the TLM community was forced to use the horrendous St. Pius X parish. Their chaplain was flung out of the archdiocese too. Millions of souls are at stake, and the archbishop of San Antonio will burn in Hell some day for rejecting God’s will for the archdiocese. Less than two years at Atonement? I don’t blame you for your attitude. It took a lot longer than that for me to come to my senses about the parish, and even longer to actually bring myself to leave. They were very, very good at hiding anything less-than-savory about the parish or school and shamed parishioners into silence if any of them dared to question what was going on. Another fanciful and ridiculous allegation without credibility. It seems there is a lot of this going on from folks with a bone to pick and axe to grind. It’s really easy to say things like “they’re good at hiding anything less-than-savory”… keyboard warriors, nothing more. Cheapshots, hit-and-runs – these come from miserable people who hold grudges. Ive been there 10 years and going strong. I’d be the first to leave if any serious impropriety was going on. I highly doubt the sexual allegations against Deacon Orr are credible. I bet it was fabricated by the Chancery to justify the conquest of the parish.
? “Reconquista” ? — I attend “regular” Mass in English but do like the Ordinariate / Anglican Use which I have experienced two or three times. It’s very important for the health of the Church to attend exclusively the Latin Mass. Even if you don’t want to take the Holy Eucharist there, visit the chapel of the Society of St. Pius X in San Antonio. You will be rewarded. This Deacon has always been a problem in the parish. He is a very manipulative person who played favorites in his roles. Fr. Phillips simply didn’t care. Really? He’s been great. However, people have no shame in tearing down the reputation of another online without any hard evidence or credibility. It’s real easy to say such-and-such a person “is a problem” or the parish “hides stuff” and run away isn’t it? Sounds like the problem to me is very evident when I read this blog and it’s comments: slanderers and gossips. Fr. Phillips cared enough to take time out with me for something proper that I needed, even though I don’t think he ever learned my name. Calling Fr. Phillips uncaring is outrageous slander and completely out of touch with reality. 1) why did the archdiocese not follow their own internal procedures in terms of handing things by going public immediately rather than meeting privately with the accused, doing an investigation, and then providing information if things were deemed to be credible from there? In short, it is because the intent is to harm Atonement as the parish is on the way out the door. The Archbishop hates the Ordinariate just as he hates the FSSP, etc. The chancery has already admitted they are not interested in investigating the claim they noted in their above message. Why would that be? Again, because this is about causing harm, not about truth. a. Parents who thought there was some form of impropriety on the part of Deacon Orr went to Father Phillips, and then were dismissed, and were so concerned that they left the parish, but took no other actions of any kind. – If I thought and believed that someone had tried to hard my child, I sure as heck would not be stopped because one priest dismissed my concern. b. That Father Phillips was willing to risk the state of the parish, school, his vocation, and potential freedom by dismissing concerns of parents about such issues due to friendship with Deacon Orr. – Really? He was willing to risk his own status as a priest, the livelihood of his family, the future of the parish and school he had worked so hard for, and maybe even potential legal ramifications because of friendship? I am fortunate to have some very good friends. I have none that are good enough friends that I would let them get away with having an inappropriate relationship with a child under my care and in so doing risk everything that I believe in and stand for, as well as that of my family. c. That Father Phillips and Father Moore would allow children to be at risk. – This is hard to believe. Father Phillips loves kids, and dotes on them, and I have never heard anyone, even his detractors, claim otherwise. d. That Father Phillips and Father Moore would allow their own children and grandchildren to be taught and ministered to by someone who multiple complaints of inappropriate behavior had been made against. – Again. Extremely hard to believe. Father Phillips has some of his grandchildren in the school there. Father Moore’s own children go to school there. I am supposed to believe that they would allow their children and grandchildren to be around someone who multiple complaints of this nature had been made against? Really? All of the things I noted above defy logic by themselves. Taken together, they are beggar belief completely. This seems to be a smear job by people who simply don’t like Father or Deacon Orr, and by an Archbishop who is motivated by greed and ideology rather than saving souls and glorifying God. In other words, I call BS until proven otherwise. Sounds like excellent analysis to me. Good for you.